Windsor Door—your one-stop shop for garage doors! Garage door opener service to keep your door moving in Oklahoma City. Because you depend on your garage door for lasting operation and safe use, we at Windsor Door are able to service any type and brand of garage door openers as well as provide the best-in-class garage door openers to you. As Oklahoma City's garage door solution, whatever you need we can help! If your garage door doesn't open or close quickly and smoothly, contact us at Windsor Door so we can repair your opener and prevent the damage a faulty opener can cause. If you want to upgrade your opener to the most reliable and durable system, we install LiftMaster openers-the safest, most efficient and dependable choice. Garage door openers in Oklahoma City are an often overlooked, yet vitally important, component of any garage door setup. This is the mechanical aspect of the door that causes it to open and close on command. If something goes wrong with this part of the door, serious issues can arise, including property damage, the inability to open or close the door and even severe injuries to you or your family. As a result, if you notice any issues with the garage openers in Oklahoma City, you need to call on our professional technicians for help. You don’t have to hope for the best when it comes to garage door openers. We offer professional repair services to ensure this element is working safely and properly. The fact is there are several issues that may arise with this component, which is why many of our technicians will recommend regular maintenance and inspections to ensure there are no issues present. When this is done, you can avoid serious and expensive repairs. You can’t wait to call for service for your garage door openers in Oklahoma City. If you allow the problem to persist, it will only get worse and more expensive to fix down the road. 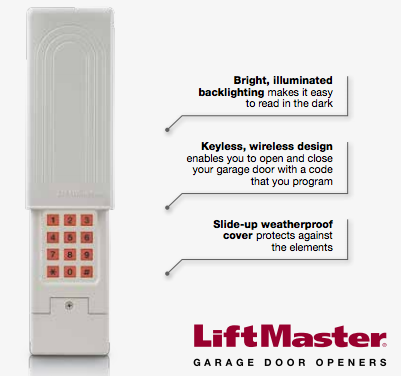 More information about garage door opener repairs is available when you contact us. Our line of Universal products provides quick, convenient ways to access your garbage when and how you need to—no matter what brand of opener is in your home. Three accessories for Total Access LiftMaster® Universal accessories give you multiple ways to access your garage or gate—no matter what you’re doing. With all three, there’s a solution for every situation—whether you’re in the car, on a bike ride or just out for a walk. Plus, every accessory is backed by a 1-year limited warranty so you can rely on them day in, day out. This visor clip remote is a convenient way to replace or consolidate your remotes. 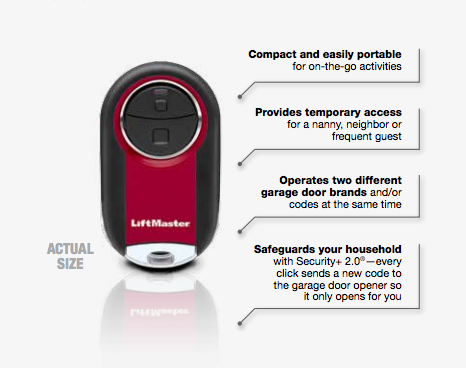 Our keychain makes getting in and out of your garage quick and easy. This keypad lets you get in and out of your garage with a simple 4-digit code that you choose.